I have a really quick post for you today, but I promise to follow it up with a yummy recipe tomorrow! If you’ve ever purchased asparagus, you probably know that mature asparagus can have some pretty woody ends. (Not tasty.) Ever wonder how much you should cut off before cooking? Me, too, so I looked it up. 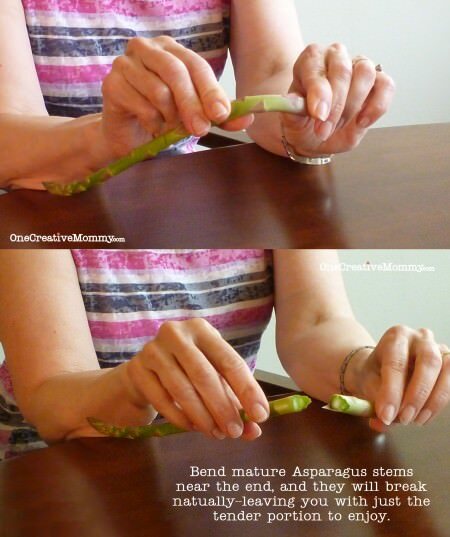 Here’s a quick tip to learn how to remove the tough ends of asparagus spears. If you hold the asparagus near the end with two hands and bend it until it snaps, it should break right at the correct place. The tough end should break right off, leaving you with nothing but the tender tip. You do not need to do this if your asparagus spears are young (thin). It’s just the really big ones that get tough. I discovered something else while working with the asparagus for this post. 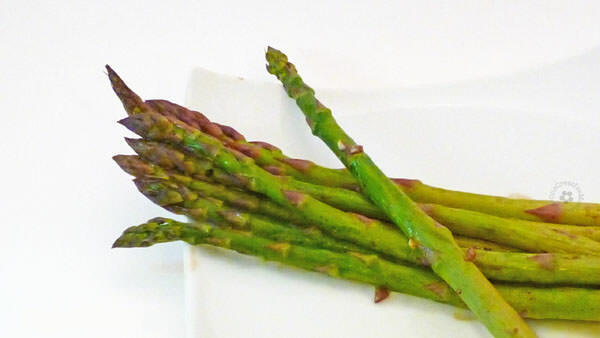 Raw asparagus is actually quite yummy! My youngest kiddo kept walking by and sneaking pieces! Special thanks to my model for showing us all how to break the asparagus!